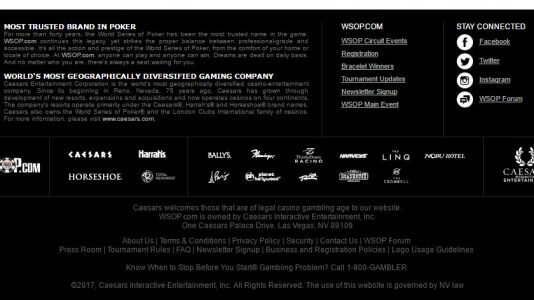 "WSOP is the first bona fide US licensed poker room listed at Casinomeister." WSOP.com is the most popular regulated online poker room in the United States. The brand operates in Nevada and New Jersey. Delaware players access it through the state’s racino websites. These are the only three states in the U.S. that have legalized and regulated online poker. WSOP.com offers new players with a 100% up to $400 first deposit bonus. It clears at a rate of $1 for every $5 in rake paid at cash games, sit and gos and tournaments. The bonus releases in $5 increments. Players have 90 days to clear the bonus. Monthly reload bonuses are offered with the same terms and conditions. The VIP program at WSOP.com is a called Action Club. Nevada and New Jersey have different programs. That occurs because the tax rate in Nevada is less than half what it is in New Jersey. WSOP.com passes some of that tax burden to New Jersey customers. Both states offer weekly freerolls to players that generate at least $2 in rake. Rewards are paid back in cash as a percentage of rake paid. This is called rakeback. All cash games, sit and gos and multi table tournaments qualify. Cash is returned through the VIP tab in the WSOP.com software. The minimum is $10. There are three tiers that are based on annual rake paid. Players keep these tiers for the current year and the next one when obtained. These levels are nearly impossible to obtain. There are three tiers that are based on annual rake paid. There are only two annual tiers in New Jersey. Both are nearly impossible to obtain. A player that makes the Diamond tier in either Nevada or New Jersey for four months in a row can receive the same card at Total Rewards. That is the rewards program for Caesars Entertainment. This Diamond card includes access to the exclusive Diamond Lounge, an annual birthday meal, waiving of resort fees and line passes. Nevada and Delaware announced an online poker partnership in February 2014. It was the first of its kind in the United States. Nevada and Delaware agreed to share player pools between the states. This agreement went live in March 2015. It does not include New Jersey. It has been a bust for Delaware. The player pool averaged about 20 players and about $40,000 in rake per month before the agreement. These numbers have dropped nearly in half since. The number of players added to the Nevada network was so negligible it barely registered. WSOP.com averages about 170 players and peaks around 400 daily in both Nevada and New Jersey. It holds a 99% market share in Nevada and a 50% market share in New Jersey. The Borgata/Party Poker partnership holds the other half of the New Jersey market. WSOP.com accepts Visa, Mastercard, Neteller, PayPal, PayNearMe, electronic check and cash at a casino cage are available as deposit options. Neteller and PayPal are ewallets. PayNearMe is a cash transfer service available at 7-11 convenience stores. Please join here. The casinos that accept cash payments in Nevada are Rio, Caesars Palace, Harrah’s, Paris and Planet Hollywood in Las Vegas. New Jersey cash deposits are processed at the Caesars casino cage in Atlantic City. Players can cash out by a check and electronic check. Accounts that deposit by Neteller and PayPal have the option available for withdrawal. Cash may be picked up at casino cages listed in the deposit section. Good luck!! 888 powers WSOP.com software in Nevada and New Jersey. 888 is the same company that operates the Delaware Lottery poker and casino network. 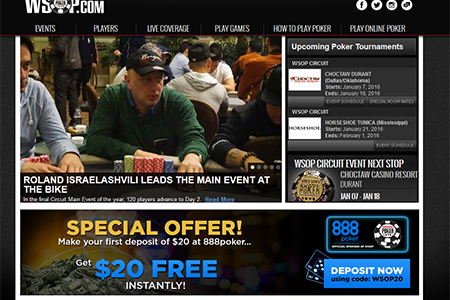 The 888 brand is not used to market Delaware online gaming. The state’s three racinos – Delaware Park, Dover Down and Harrington Raceway – are used. 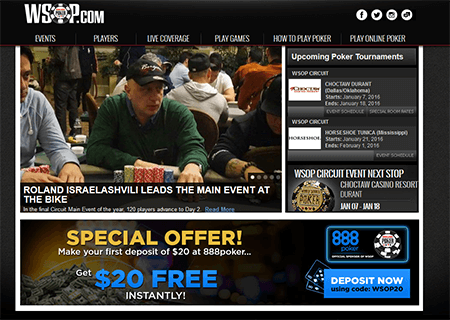 WSOP.com New Jersey is an intrastate site. It shares player pools with 888 New Jersey. WSOP.com Nevada shares all cash games and most tournaments with Delaware. WSOP.com offers five different poker variants. Texas Hold’em is by far the most popular. It is available in no limit and fixed limit. Virtually all of the Texas Hold’em action is at no limit. There is also Pot Limit Omaha High and High/Low. Fixed limit Omaha High/Low is spread. Seven Card Stud and Seven Card Stud High/Low are in the software in the fixed limit format. Neither stud game is very popular. Cash games rake 5% in Nevada and 5.5% in New Jersey. The cap depends on the limit. The rake is higher in New Jersey because of the higher tax rate. Sit and gos are available in several formats. All Texas Hold’em tournaments are spread as no limit. These games are available in 2, 6, 9 and 18 seats. The speeds are normal, turbo and super turbo. The rake is 9% for normal speed sit and gos, 8% for turbo and 7% for super turbo. Some No Limit Texas Hold’em sit and gos are satellites to multi table tournaments. Pot Limit Omaha and Omaha High/Low are available as sit and gos. These events have six seats and run at normal speed. There are no other sit and go games spread. Sit and go buy-in amounts are $1, $5, $10, $25, $50, $100 and $200. It is rare to find a sit and go running higher than $25 in either Nevada or New Jersey. WSOP.com spreads about 50 tournaments each day. The biggest tournament is held on Sunday. It has a $200 buy-in. The guaranteed prize pool varies. It depends on the season. The lowest is $15,000. It can run as high as $50,000 in Nevada during the summer World Series of Poker season. The typical guaranteed prize pool is $20,000 or $25,000. This weekly event has several satellites and super satellites throughout the week. Each state spreads several $3,000 to $5,000 daily guaranteed prize pool tournaments. These events have buy-ins between $30 and $50. The smallest buy-in event is $1. These run many times each day. Most tournaments offer rebuys and add-ons. It is safe to assume that any tournament that is not described as a freezeout has an R&A. Late registration is available one hour after the first hand is dealt in smaller tournaments. Most large tournaments have a two-hour registration period. All tournaments must have eight players to start. Nearly all multi table tournaments at WSOP.com are No Limit Texas Hold’em. There are a couple of Pot Limit Omaha and Pot Limit Omaha High/Low tournaments each week. WSOP.com Nevada offers many satellites during the summer tournament season. These start with satellites to the $500 Casino Employees Event #1. Satellites run for $500 lammers daily throughout the World Series of Poker. Many sit and gos are spread to events held in the coming days that run as soon as it fills. The World Series of Poker started running an online event in 2015. This was a $1,000 tournament held on July 2. It started online at WSOP.com and moved to the Rio when it reached six-handed. It relaunched on July 4 and ran until there was a winner. This tournament was considered just as much of a bracelet event as the ones held entirely at Rio. Players were encouraged to log into WSOP.com at Rio. A lounge was created with plugs and wireless internet connections. A concierge office was set up in the Lambada Room at the Rio Convention Center throughout the World Series of Poker. Deposits, withdrawals and account creation were available in this office. New Jersey World Series of Poker tournaments are not as frequent as ones in Nevada. WSOP.com NJ spread some Main Event satellites and some special Sunday tournaments offering travel packages. WSOP would be even more awesome if they were able to take on more States, and if 888 Holdings didn’t have such a spotted past. But where else are you going to play if you want to play online poker?